To print your data, click on the File menu and then click on the Print menu item. The benefit of printing the Default Layout is that it’s quick to get a nice printed report of your record details. Also, if a single record is quite long, Tap Forms will intelligently span the printout of the record across multiple pages, avoiding cutting off the contents of an individual field across pages. Initially when you display the Print sheet, it will appear with only the very basic print settings. 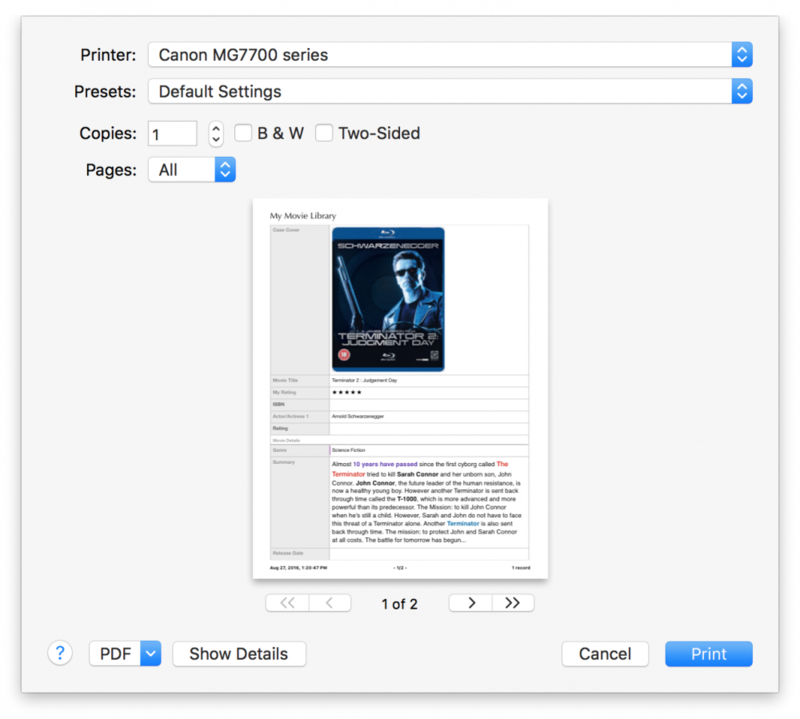 To see the advanced print settings, click on the Show Details button. You can also use the Fields list to select which fields you would like to print or not print. Tap Forms will make sure there are no gaps in the printout as you enable or disable different fields. The print sheet will expand to display many more options for printing, including a variety of Tap Forms specific options. The top area of the print sheet contain standard print settings that are available in most apps. 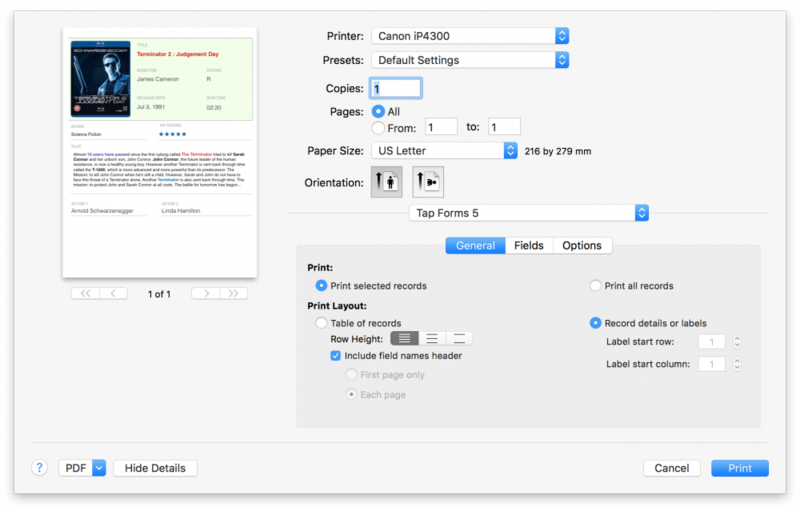 You can select the printer, the number of copies, which pages to print, the paper size, and the paper orientation. The bottom area contains options specific to Tap Forms. Print selected records – to print just the records you’ve selected in the records list view. Print all records – no matter how many records are selected. 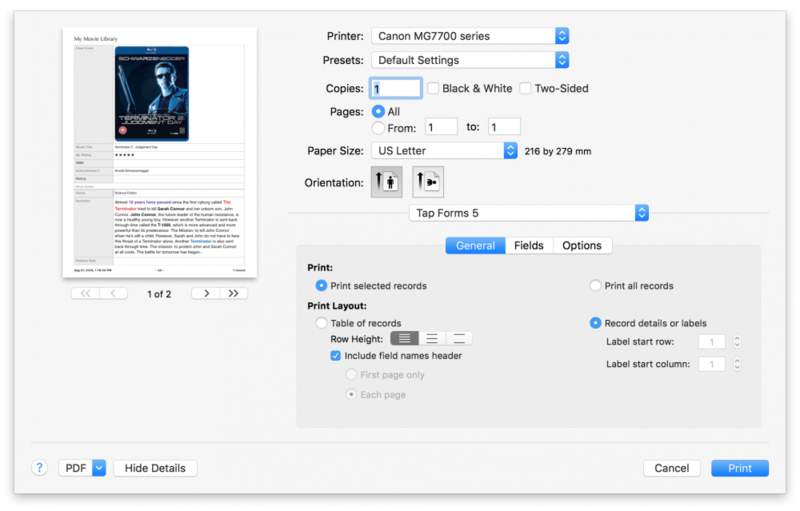 Print field borders – to enable or disable printing of any borders around fields in your custom layout. There’s not much difference in the print sheet when you’re printing a custom layout. 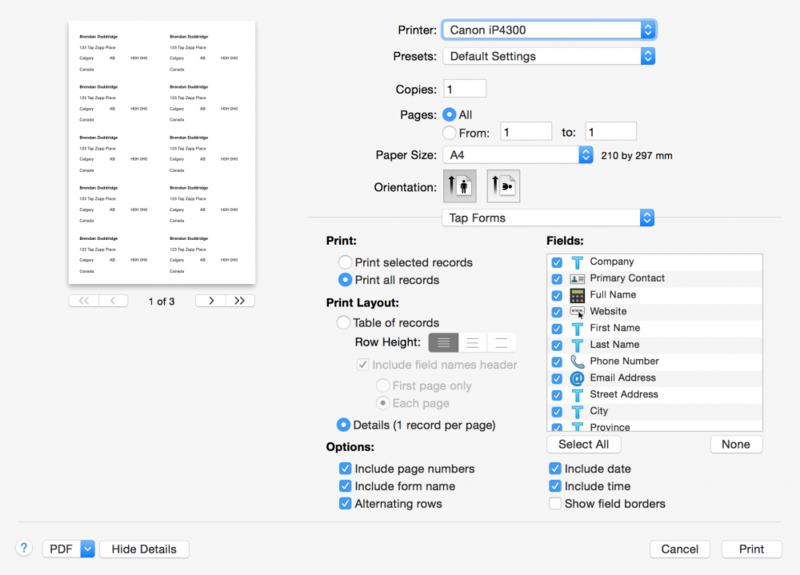 If you need to print multiple records per page in a list format with headers and footers, then use this print layout. Tap Forms will print as many columns as will fit on a single page width. You can change to landscape orientation to get more room to print additional columns. You can also enable or disable different fields to print on the list view. 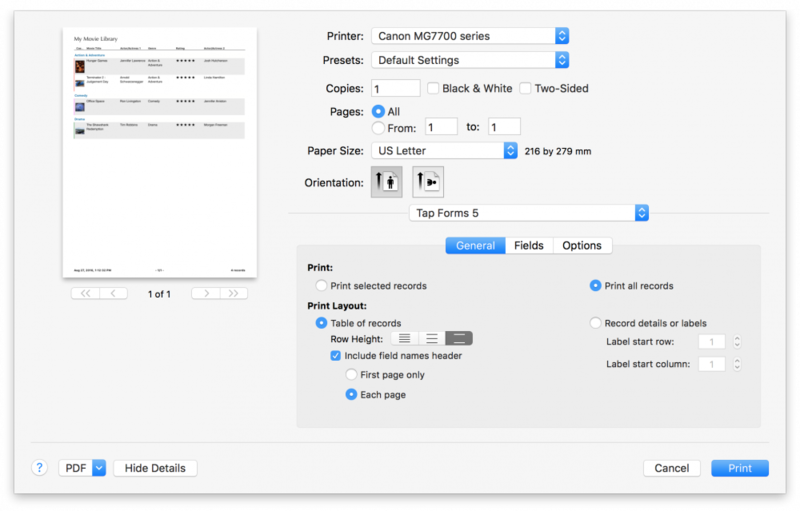 *To adjust the widths of the columns for printing, click on the Fields tab on the Print panel, double-click on each width, type in a new value, and press the Return key to accept the new width. Tap Forms will remember the widths of the columns for the next time you print that form. *To print your records with subtotals per section, switch to the Multi-Column List View, then click the little menu button at the top-right of the Multi-Column List View. Then select the Show Group Summaries option. Tap Forms will now show you sub-totals per section. This will also appear on the printout. Most of the options on the print sheet will have some effect on the printout. For example, you can enable or disable the printing of the form name, the date, the time, and choose whether or not you want alternating light and dark row backgrounds for your records.